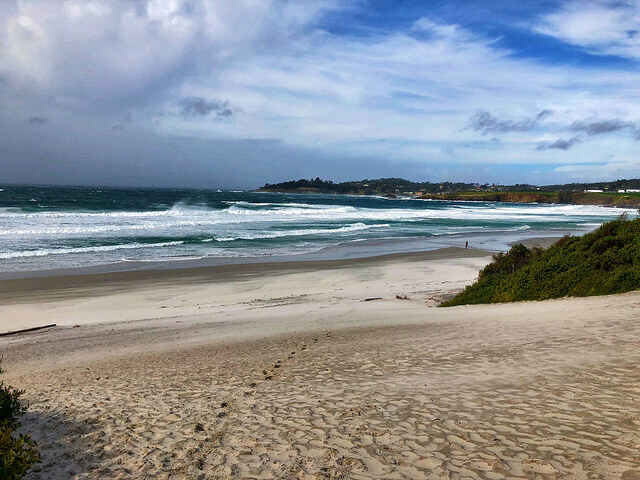 Carmel-by-the-Sea is a grand place to be in the winter. I confess that I love visiting this artist’s community any time of year, but December, January and February are often bonus months. The prices are lower, the weather is often mild in this Mediterranean coastal setting and the crowds are non existent. I was quite pleased with myself that I’d found The Vagabond’s House, a boutique inn that is pet-friendly. Who could ask for anything more? But I received quite a few more unexpected pleasures at this family-owned bed and breakfast. A member of Unique Inns, what makes Vagabond’s House unique is it’s decor. Every room is different, yet they all offer a cottage like feeling, with plenty of room to spread out. Even our Labrador Retriever stretched out in front of the gas fireplace, resting comfortably as the rain fell outside our corner room. A steaming cup of hot chocolate was delivered to my room when the innkeeper learned that I was not a coffee drinker. A dog-friendly blanket, along with dog treats was waiting for our pup in the room. Don’t worry, there was the fanciest espresso machine that I’d ever seen in the alcove by the hotel lobby. This magnificent coffee maker made everything from espresso to macchiato and all without requiring a tip to the bariesta. My husband does love a good cup of coffee in the morning. If you can’t wait for room service, they will deliver your own coffee pot to your room; no aging coffee pods at this house! 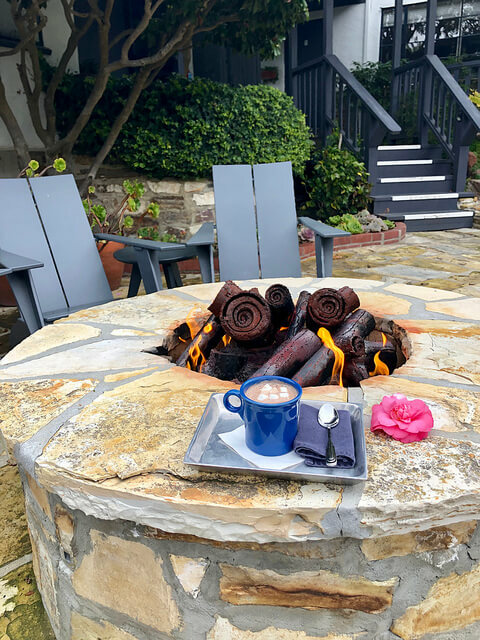 On a sunny day or evening, after a walk on Carmel Beach, return to Vagabond’s House for a massage or custom facial at the petite spa. 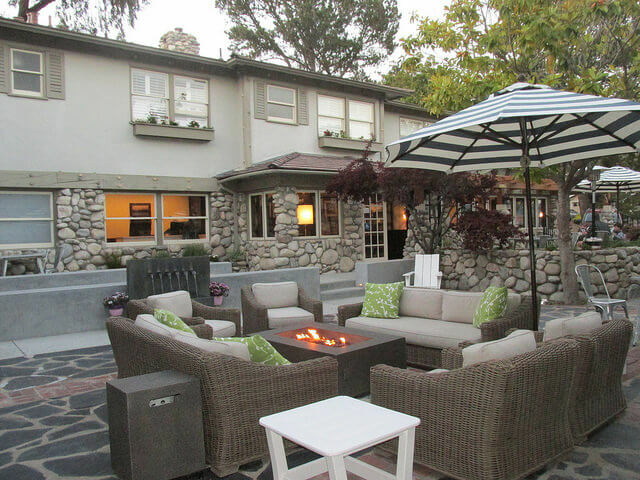 Then pour yourself a glass of wine and pull up a chair by the outdoor gas fire pit. Wine and cheese, with a few other nibbles, are served each afternoon in the lobby. The twinkly white lights come on after the sun sets and the fountain babbles in the background. 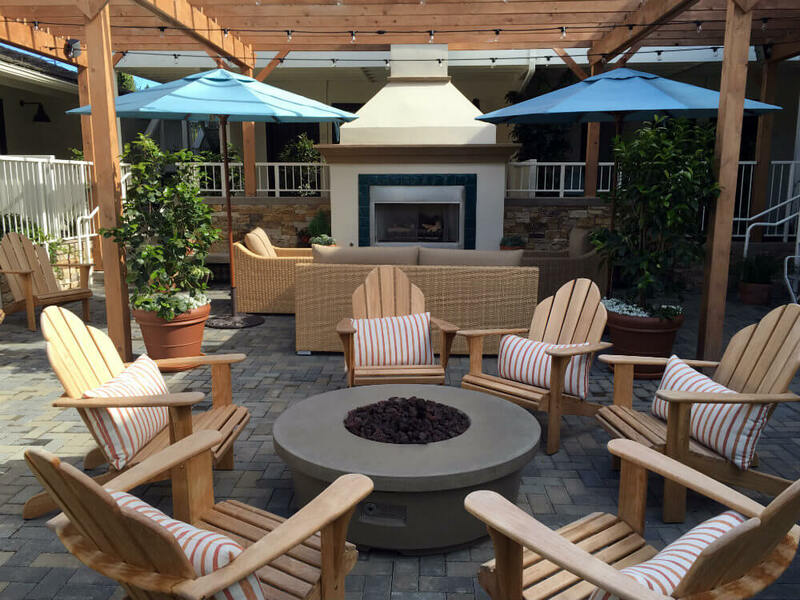 It’s the ideal place to sit and laugh with a friend, reflect on the day’s adventures, or plan where you’ll go for dinner that evening. 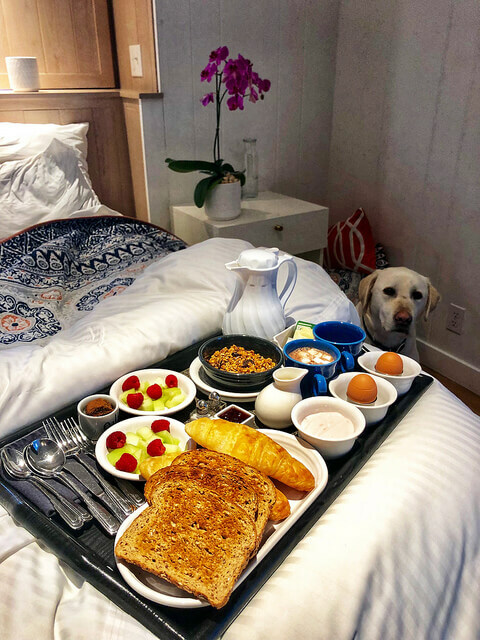 Sometimes bed and breakfast properties are disliked by some because they don’t want to sit in a dining room with other guests eating breakfast. Instead, they prefer the privacy of dining in their own room. 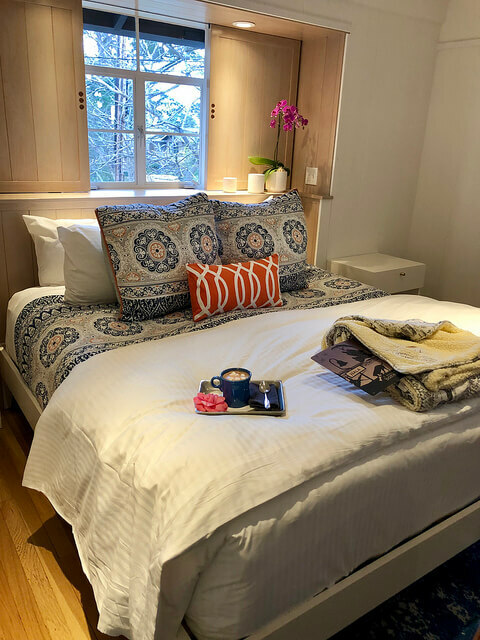 Vagabond’s House understands this request for in-room dining and has created a menu where guests select their morning choices the night prior. Select your preferred time for dining and voila, breakfast arrives at the knock of a door. The eco-conscious inn served breakfast on real plates, accompanied with cloth napkins. You won’t find disposable plastic containers here! Even the jam for the toast is homemade; no single use plastic packets. 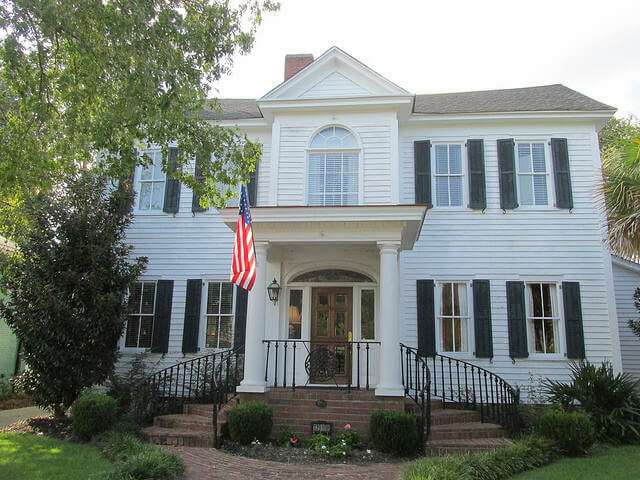 It’s the little touches like farm fresh eggs and fresh fruit that make this bed and breakfast shine. One of my favorite things about The Vagabond’s House was the old-fashioned bath tub and the heated tile floor. 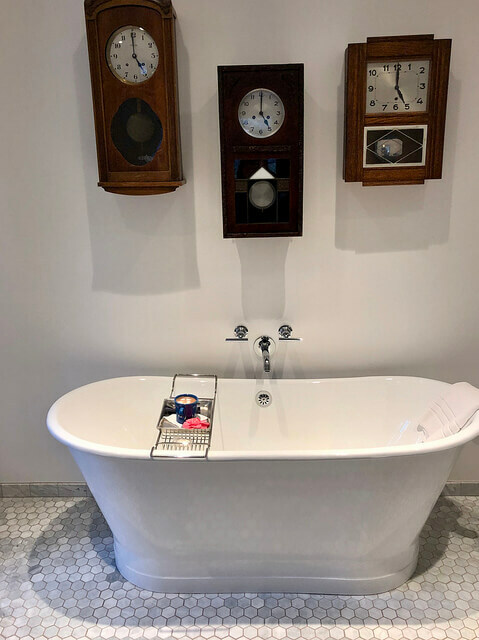 I could have spent the entire evening soaking in that tub and reading a book. I also liked the way the bathroom wallpaper was composed of actual pages from books. As a writer myself, I loved the owner’s attention to detail and his nod to the Carmel writer’s colony. Rates range from $219 to $439 depending on the room category. You can compare rates at Hotels.com or Expedia. 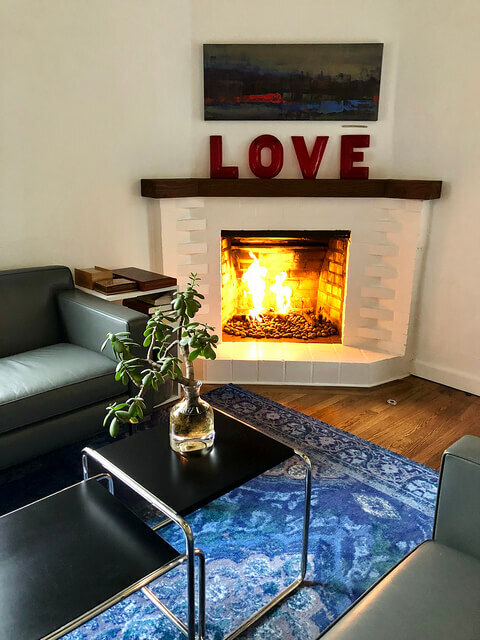 Hotel review and all photos by San Francisco Bay Area travel writer Nancy D. Brown. 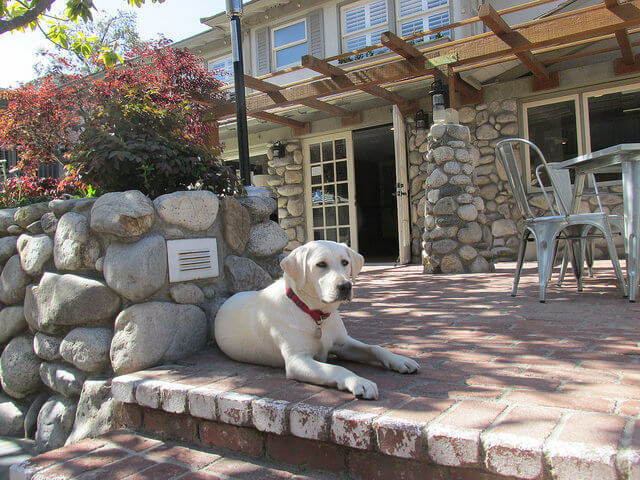 Her stay was hosted by The Vagabond’s House Inn. As always, her thoughts and opinions are her own.